ONE OF OUR OWN NEEDS OUR IMEDIATE HELP !!!!!!!! $35 is great, some of the other states and cities a dog resisting arrest means, Just shot it or its a Chow Euthanize it. Molly got off lucky. So she had a $35 fine for resisting arrest (I'm 100% serious about that). Plus $10 for jay walking, $15 for defacing public property (fire hydrant) , $25 for loitering in the K-mart parking lot. I'm very glad to hear that Molly is safe and with someone who will give her the life she deserves. The $35 "fine" was probably to cover the cost of having to sedate her .. *L* .. they may call it "resisting arrest" but if they had to use a drug to catch her there will be an additional cost to that. I'm still a bit confused as to why Molly was being given away in the first place .. and why the original owners weren't more active in finding her. Kudos to those who helped save her life. what awesome news. i just got caught up with this, and im sittin hear crying my eyes out. you guys are the most amazing group of caring and selfless people. i am honored to know all of you. molly we send you lots of hugs!!! good luck in your new home. You are the most incredible group of people--I just found this story going on and read from start to finish like a novel--complete with happy ending! Someone should write that book. So wonderful to see so much caring. Now that Molly has been found and is hopefully going to have a forever home, I do wonder why she needed to be rehomed. Canadian laws are similar to US laws. The want ads in the newspapers state 'no smoking, no pets' I bet 80% of landlords say that. Ppl get rid of their pets because of this. Those who keep their pets win in the court. There is no law that says a tenant cannot own a pet. Even signing a yearly lease, still by law the tenant can keep the pet. Unless I need to go into an old folks home or get sick, I'd rather live in a trailer, tent or have the cottage winterized. My pets are my babies and they stay with me till their last breath. Ditto... and that includes telling Hubby that he goes before the dogs go (when he is mad at them and says they are out the door) and I mean it. I didn't get the impression there was any judgement there when I started reading the post, but I can see why you would be upset by the statement that you didn't do anything when you did, I'm sure that it was just a misunderstanding... obviously you cared enough about Sweet Ms. Molly to find her a good home that you felt you could trust! And when we are faced with a horrible decision like you had to make, you did the best possible thing that you could! It had to hurt your heart to make that decision, and I commend you for doing it. I'm sorry there was mistaken information about your efforts, and I am sure that you are even more elated than the rest of us that Ms. Molly's saga has come to a very happy conclusion! Kudos for everyone who helped find her, esp for you Bama. I tried to reply last night when I got home, but this of course struck a tender chord in me while reading it and I had to walk away. I was going to post some other websites in case you ever do lose one. Here are some others. 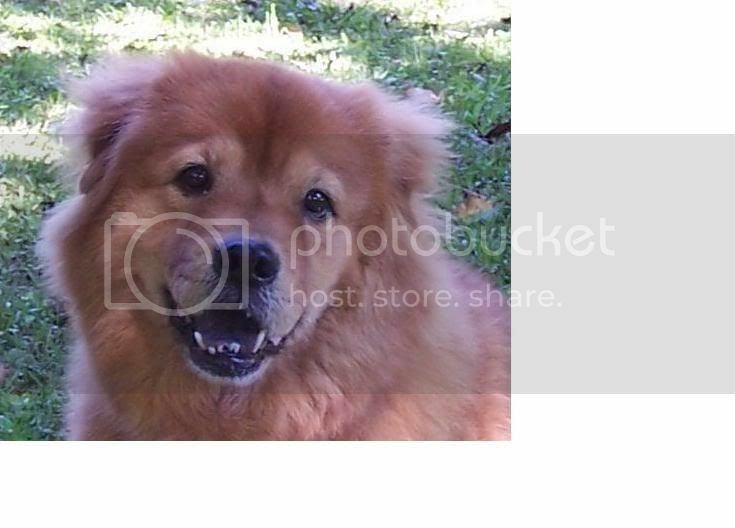 the owner of this site called me when Marshall disappeared the first time, he had lost an older dog who he never found. it inspired him to create the website. you register your pet with them and then you get a 1800LOSTDOG tag with a id number on it. anybody can call the service for free and report what they saw, they will cross reference their database of reported lost pets and contact the owner. this guy is a pet detective, actually found jim carreys dog and is known as the pet detective of the stars. even made it on the tonight show I think. He offers counseling, makes flyers, and for a price will come out and look four your lost pet. He ain't cheap, but if you got the money and want your pet back bad enough he's your guy. Bama, in an earlier reply you remarked how many Chows are out there. You don't realize how many dogs can be out there until you go looking for one. It is a gut wrenching, heartbreaking experience which exposes a horrible side our society has. Once you take they dive into it, you will never look at a breeder (any kind) or slack pet owners the same ever again. Good Grief! I missed all this - I have just read it! Poor Miss Molly, I am so glad she is safe - what a wonderful effort you all put in and I am so glad that you found her. I hope we can get news of her, bless her, she must have been very frightened. I cannot speak for everybody on this board, just myself. Please don't feel like anybody is "bashing" you or your mother. You obviously did what you felt was the best thing for you and your son. I can only imagine how heartwrenching it must have been for you. I think most of us were just confused when we first read about this because we didnt know the background story and it just sort of seemed to come out of the blue. It was like "Mollies Missing?? What the heck? Nancy's Mollie?" I will admit however, that while I was following the story and praying for Mollies safe return to her new home, I couldn't help but think of your Mom. First losing Koda and now this, well I just feel bad for her AND for you. I hope you don't go away with bad feelings, every single person on this board is here for a reason. Our shared love of Chows, plain & simple. Sometimes maybe things are said because of our passionate feelings for these creatures. Anyway, hugs to you and your mom. Please correct me if I am wrong or out of place. Molly the chow escaped before easter. Nancy posted here Apr.13th, nothing was mentioned about Molly's escape. 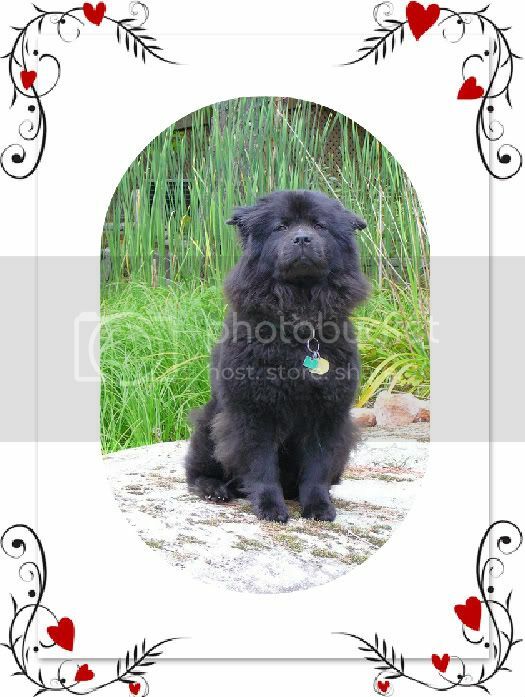 I didn't see any ad on petharbor or petfinders that an IL chow was lost. Probably a bunch of misunderstandings, lack of communication, who knows. Main thing is the chow girl was located and I hope she found a good home. If it doesn't work out, please don't hesitate to post here, I am sure someone will help. Last edited by sit_by_the_beach on Sat Apr 21, 2007 9:06 am, edited 1 time in total. now that I have calmed down I need to apologize to becky about broadcasting to the entire board about what I was told by Bonnie. I should have done that in a pm. I was mad when I read the posts being bashed when the entire story was not told. If anything becky helped me by bringing Ms Molly and the ** together. Now that I know that Molly has connected to Bonnie I am so happy. Again becky I am truly sorry. Amber, I'm going to keep tabs on Molly. She is such a beautiful little thing. So tiny! I am sorry to for not trying to explain more when this first came out. I'm not good with words and the last thing I wanted was to make you or your mom feel like you were being attacked. When I left last night, Molly kept going over to Bonnie on her own. She'd let any of us pet her but Doug. Now today she's giving Bonnie kisses and follows her around, and she walks close to Doug, is getting curious about him. She's going to be fine. I'm sure once Molly settles in you and your mom can go visit Molly when you want to. It was just really freaking me out at the thought of her running loose in Decatur. This was only brought out for Molly's sake. A desperate move to somehow pull off a miracle to find her. I'm sorry you felt attacked. I'm glad to hear that...Once Molly really gets to know Doug she will be his Dog "Baby" She was my baby but she was 10 x closer to my boyfriend Matt then she was me. It's just very shocking that she is going up to Bonnie so quickly. But i'm so very happy. Please keep me posted she still like my baby!!! I'll keep you posted. I want to go Monday over there, take my camera and get some pictures so you, your mom and everyone can see how she's doing. Maybe by then she'll have allowed them to brush her, she really needs it, that and a bath. She was really looking nasty after her 2 wk adventure. I picked out some stickers, my husband picked out a couple. I thought she was scared of men but that doesn't seem to be so. I think her deal yesterday with Doug is she remembered him as being that scarey guy who had her in his truck! It might take a little longer for her to see he can be trusted. But this morning she was starting to get curious about him. I told Bonnie I'd call tomorrow to get a update on Molly. Yesterday she was so exhausted, when we'd pet her she'd close her eyes, she just wanted to sleep but was so scared. I'm anxious for her to get her coat in again, she is going to turn heads. She is such a sweet thing, and so tiny. 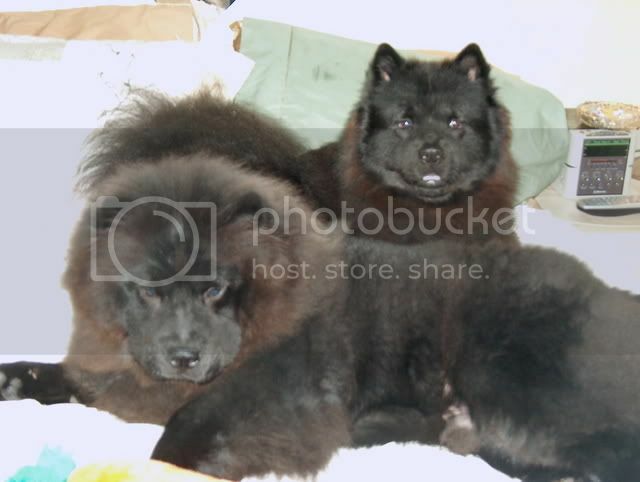 I always thought Gracie was s small Chow but she's huge compared to Molly. I am not trying to get another dog I still live in the same place nor, Will I be trying to get another dog for a long time. As for my mom that's her buisness not mine. My son comes first befor anything and I mean anything. I loved molly and it killed me to have to rehome her. I had no choice I didn't have the money to find another place to live. It was either Keep a roof over my sons head or be out on the streets but like I said I choice my son..And it hurt be everyday knowing that molly was with people she didn't know and now that I know she is doing great with the ** I am so happy. I moved the post to your post in Community. Amber, don't beat yourself up now. It is all over and Molly is safe and is getting used to her new home. She will settle in, I am sure and you must put this behind you and you were and are right to put your son first - even before Molly. In situations like this everybody gets a bit uptight and emotions run high - it always has been and I suspect always will do. You are safe with your son. Molly is safe in her new home. I just thank God this is so. So, love to you all and purple kisses from Milly and Mabel. Please give our love to your Mum. I can't believe I missed all of this in the past few days! All of you are very special people and I'm very happy to be associated with you, even if it's only through the internet. OMG I am so happy molly made her way home. We just got back home, and I could not be more excited. I started reading from where I left off and I was in so much excitement I was biting my nails!! I cried a little when I heard that it really was her by sweetpea. I am so proud of all of you that made this happen. Now she is microchipped and will have an easier way hopefully if she ever gets lost again (hopefully this never, never, never, ever!! happens again) and needs the shelter to help her find her parents. I am so so so so happy. Good Job to every single one of you that made this happen!! Molly is now Baby and looks happy with her new home!